Concession Stands use many condiment sauces to top off fries, burgers, hotdogs and more including ketchup. The restaurant supply superstore has the widest selection of ketchup packets around for ballgames and concerts. Mayo, Dressings and Condiments Ketchup - 7 Grm. Heinz Plastic Top Down Ketchup Red - 14 Oz. Heinz Ketchup Bottle - 14 Oz. Heinz Single Serve Ketchup - 7 Grm. Heinz Single Serve Ketchup - 11 Grm. Heinz Single Serve Ketchup 9 Grm. Heinz Ketchup Single Serve - 9 Grm. 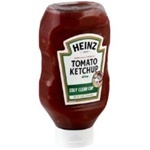 Heinz Upside Down Tomato Ketchup - 20 Oz. Heinz Ketchup Single Serve 9 Grm. Heinz Vol Pak Ketchup - 3 Gal. Heinz Ketchup Easy Squeeze Clear - 20 Oz. Heinz Stay Clean Cap Tomato Ketchup - 14 Oz. 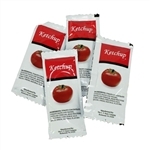 Portion Pac Ketchup Single Serve Foil Pouch 9 Grm. Portion Pac Americana Ketchup Fancy - 9 Grm. Wide Mouth Glass Ketchup - 12 Oz. Condiment Ketchup Clear Top Down Bottle - 14 Oz. Condiment Ketchup - 1.25 Oz. Condiment Dip and Squeeze Tomato Ketchup - 27 gm. Ketchup Single Serve Simply Heinz - 9 gm. Make sure your patrons have easy access to ketchup in your concession stand for their french fries, tater tots, onion rings, hamburgers and other foods.